Even though many of the basic principles of Search and SEO is the same, as when I started in the 1990’s, this business is constantly evolving. What worked yesterday may not work (as well or at all) today. The search engines improve day by day, introduce new filterings and adjust the old ones. Last year alone we learned that Google made more than 1.000 updates based on tens of thousands of experiments and user testings. Competition change. You may think you are really smart and on top of the game but then a couple of kids come around and do some amazing stuff that blow you search visibility away. New technologies are introduced. Voice search, “one result” home boxes and personal assistants are here. Maybe not perfect yet but soon they will be. And whats next? We can guess but we can’t know for sure. But at great conferences like SMX some of the brightest minds in the industry meet and discuss not only the present but to a great extend the future of search. We inspire each other, provoke old thinking and make us better prepared for what may be coming next so we can be ahead of the game and ready for the moving target as it approach us. 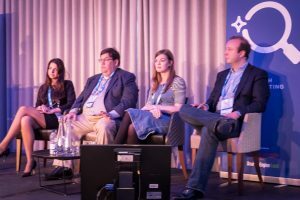 AMP – Googles Accelerated Mobile Pages, that was introduced last year, was one of the most discussed topics at this conferences. Besides the dedicated AMP session on the first day, where John Cole and Dawn Anderson shared their much appreciated insights and tips, AMP was also brought up in several other sessions. Including the one I spoke on: The Latest In Advanced Technical SEO. AMP is, to say the least, one of the most controversial new technologies introduced for many years. Despite the fact that Google keep claiming its an Open Source project AMP have been getting and increasing amount of justified criticism for being a proprietary standard that goes against the open standards most of the web is build on. Google say that one of the primary goals of AMP is to make the web faster, give users and better (not the least mobile) experience and “force” developers to get rid of all the crap code that fill up normal web pages. There is no doubt that Googles goal with AMP is not only to make the web faster. It is also part of the ongoing battle they have with Facebook over winning the mobile war. Even though it could be said that Facebooks solutions is even worse AMP definitely have its serious flaws too. However, for now AMP actually do give you a marketing boost. That’s a fact. At the conference we saw several studies that prove the fact that AMP does give you better visibility in Google and more organic visitors. This is also why we, at Waimea Digital, have chosen to adapt to AMP and now include it as standard at all our Waimea Business solutions. For now. With Baidu’s announced adaption of AMP it can help increase the visibility of websites that use it even more. But we can’t be sure what the future will bring. Will AMP survive or not? I am not sure. As it was pointed out at the conference one of the most important things for AMP to survive is that Google let go of it. If they really want to it to be Open Source they need to have less Google people in the AMP team and more independent contributors. If Google fail with AMP it won’t be the first time a new Google technology do so. Remember Google Wave that was going to revolutionize email? Or Google video (pre YouTube)? Or Google Glass? Or Orkut? The list is long. Anyway, for now I personally see a marketing benefit of using AMP but as both I and others pointed out in our presentation AMP is not easy to get right. The official AMP plugin for WordPress haven’t been updated for 6 month and with the almost weekly changes to the AMP standard that is (off course) not working. It’s hard work to make a perfect AMP implementation and you need to constantly monitor it for important changes. But lets see. If AMP fail we just drop it again. No harm done. So far we enjoy the increased visibility it does in fact give us. 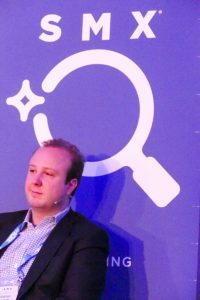 Frederic Schaub – the Senior Manager of Global Strategies at Marriott Digital Services gave a great presentation of the many SEO challenges you are faced with if your company is working globally, as it is the case with Marriott hotels. But also all the benefits you can enjoy if you do it right. – Spanish is not the same in all Spanish speaking regions, the same is true for English. And there are several versions of Chinese – just to mention a few of the most basic language problems. Make sure you involve born locals when researching for relevant keywords. – This is probably the most complicated issue to deal with as there are not always an easy way to look this up. You need again to involve people that live in the culture you want to target. Don’t assume you know just because you have been there! – Even though Google dominate the global search market in some regions other search engines are just – or even more, important. In China it’s Baidu. In Russia Yandex. It’s crucial to know how locals search. The same is true for social media and even credit cards are not the same – and in some regions they expect to pay in cash on delivery or in installments. You have to give the users the options they expect. Also, make sure your shopping card do not include fixed fields for adresses. Formats are not the same. In some countries they don’t use ZIP-codes and in some they don’t use street names and numbers. There is off course a great deal of other important issues to deal with if you want to do global SEO. The important thing to keep in mind is that you can’t expect everything to work the same or expect to know. Do your research for each market and adapt. Then you will be rewarded with much better visibility, traffic and sales. One of my oldest friends in the search industry Bill Hunt is one of the best speakers I know. 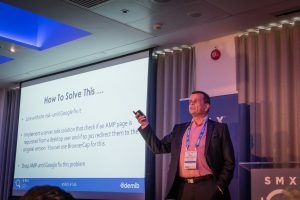 At SMX London this year he gave an excellent presentation about how you through advanced keyword research can learn much more about the true intent of the users. And if applied right you can gain so much more value. In one example Bill showed how updating the META-description of a vodka drinks page did not only increase the CTR from under 2% to almost 15% but also increased the ranking from a top 3 to a top 1 position in Google. Nothing else was done than creating a better META-description! This, I believe, was a big surprise to many, given the fact that META-descriptions in itself is not a ranking factor in Google. And despite Google claiming CTR is not a (strong) ranking factor this example proved something else. In the opening keynote talk Juan Felipe Rincon from Google said that Google do not really like to use the term “penalty”. Well, maybe they don’t but nevertheless Google do penalize websites for violation of their Webmaster Guidelines. But actually not quite as often as many think. This topic was also brought up in one of my sessions. Very often webmasters think they got a Google penalty when in fact they have just been hit by some sort of filtering – for duplicate content, thin content or bad links being removed. I know that both filtering and penalties can feel like a penalty. It hurts equally much but it is important to know the difference! If you suffer from a filtering its quite easy to fix. Just fix the problem and soon you will have regained your visibility in Google. However, if you are actually hit by a manual penalty its much more time consuming and often difficult to get back in. The topic of penalties and how to get back in was the topic of a great presentation by another one of my old friends, Kaspar Szymanski – former Google Quality Team editor and now Co-Founder of SearchBrothers.com. Kaspar went through all the different types of manual Google penalties you can get and how to deal with each ones of them, how to read them (and read between the lines) and how to get back at track. With a manual penalty you will most often get a notification from Google though Google Search Console. Read it carefully! Be polite! Remember real humans have to deal with your request. Don’t threaten Google with legal actions – you won’t win such actions against Google anyway and it just makes you look stupid making such threats. Don’t use emotions. They heard it all before. It won’t make your case any better if you tell them how your children will go hungry to bed, your wife will leave you or you have to lay off staff if you don’t get back into Google. Drop it. Make your reconsideration request short and to the point. They have a lot to read and don’t have time for long stories. Be honest. Don’t lie about what you did. Say you are sorry. That can actually help. Let them know you accept the wrong doing you did and that you now intent to follow Googles guidelines. Be patent. It can take weeks to handle your request. Off course I learned a lot more than this brief summary includes. And not only that, I had a great time with old friends and made new ones. That part alone is worth it all. If you are serious about SEO I highly recommend that you join one of the next SMX conferences. This is your best chance to learn all about the new trends in the industry, meet the reps from the Search Engines, check out new cool tools and mingle with like-minded colleagues. You can get an overview of all the SMX conferences available here. 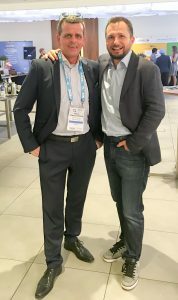 Thank you very much to Chris Sherman, Danny Sullivan and the great team of Rising Media and Search Engine Land for inviting me to speak again. Looking forward to see you all again at the next event.